All you want is to have a good ROI on your social media marketing. And for pizza to be calorieless. But between the complex tools and spending money on marketing tactics that don’t work, you’re starting to think it’ll never happen. Well, don’t give up just yet. There are still a few codes left for an easy-to-use ROI booster, Sociamonials. But you better hurry! Sociamonials helps you optimize your campaigns and increase your ROI with important social media analytics and automation. There are a ton of Sociamonials features to get excited about but let's start with the most intriguing: campaigns. Sociamonials is the Golden Ticket to running contests as big as Wonka’s and sweepstakes that help get your brand out there. Launching campaigns within Sociamonials is a piece of cake with ready-made design templates and stunning background images. The best part? No coding required. 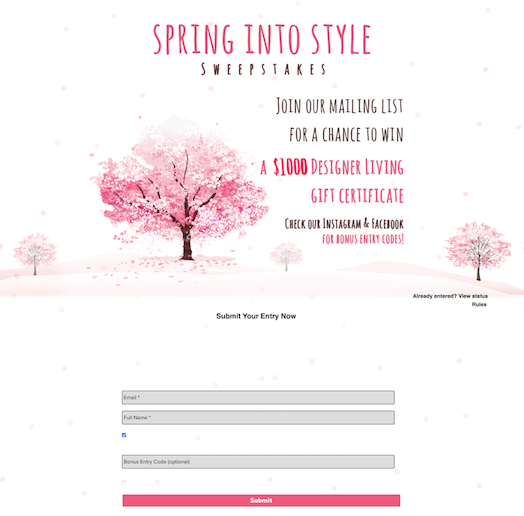 Your contests are fitted with automatic fraud prevention, the ability to approve submissions via mobile, white label options that make your brand the star, and split testing so you can find out which of your campaigns performed best. You will have participants vouching for you and sharing your brand with everyone they know. With custom social media metrics that track what actually matters to your business, Sociamonials works smart so you don’t have to work hard. Thanks to a sleek analytics page, you get at-a-glance ROI and marketing funnel info so you can see which social posts and networks generate the most engagement, leads, and revenue. 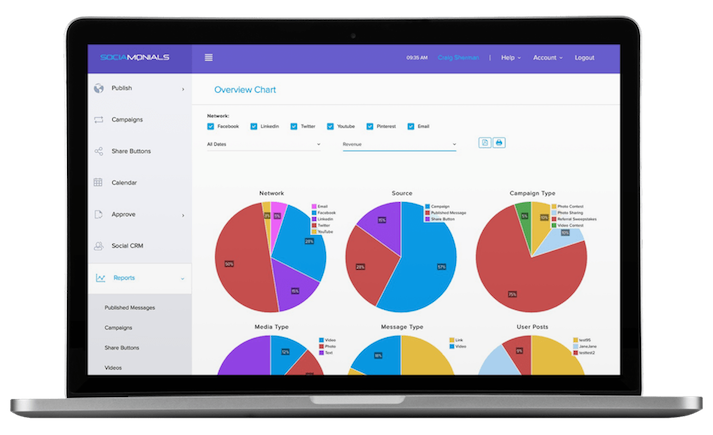 You’ll get astounding interactive charts and be able to create unlimited reports from the data, unlike other solutions. Forget to make a post during peak engagement times? 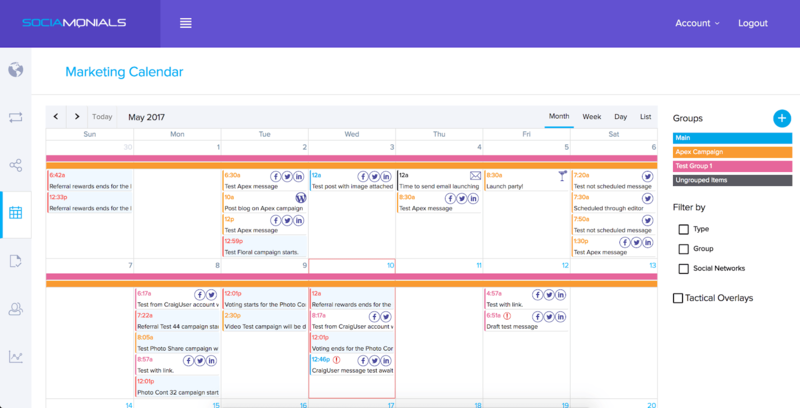 Sociamonials gives you the ability to schedule posts in advance and automate re-posts on a handy calendar, so you’re engaging your audience even when you’re away from your devices. What makes the tool extra special is that you get to define what “optimal post time” means, whether you want the best time to increase sign-ups, registrations, sales, or leads (...those times are different?). Just sit back, relax, and let Sociamonials automatically pick the best times to post for each network based on the business metrics you set. 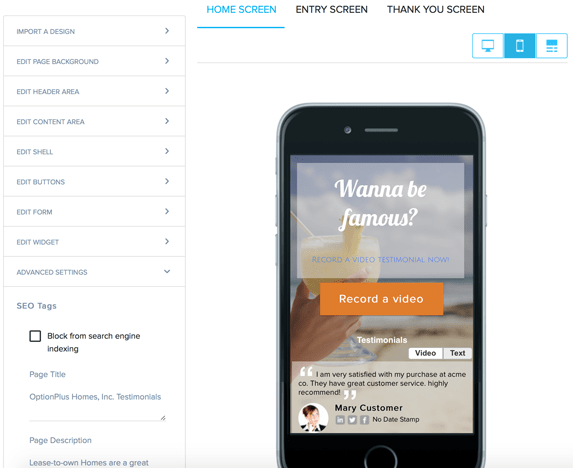 Get users even more involved with Sociamonials’ user-generated content integration that lets your customers share video testimonials, photos, and stories. You already know your users love you — let ‘em spread the love with peer reviews that new audiences instinctively trust. All you have to do is hit approve, and Sociamonials syndicates UGC to your social media pages and website automatically. But the features don't end there. click here to see a full list of features! 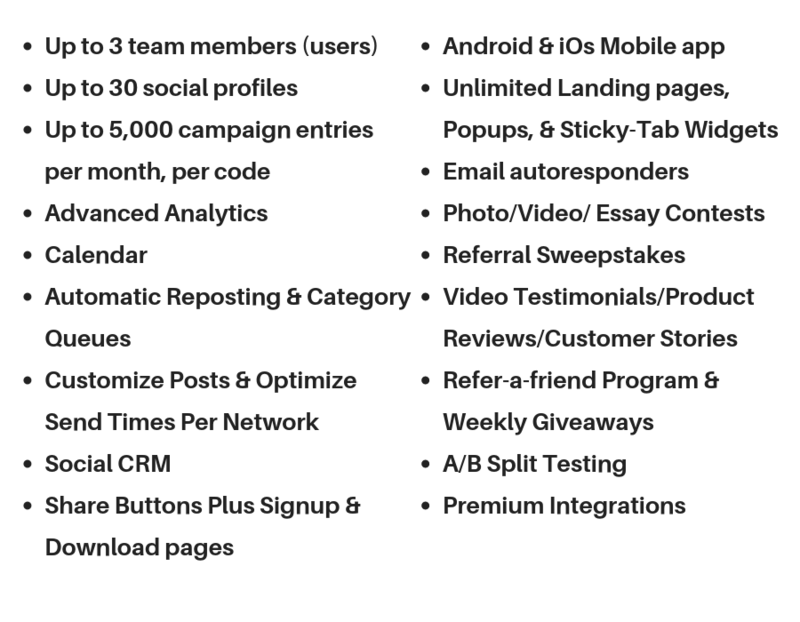 Stack this deal as many times as you want to unlock more social profiles and campaign entries (each code brings 30 social profiles and 5,000 campaign entries a month for ALL campaign types). Ineffective social media stops now. Transform your social media before we run out of codes! 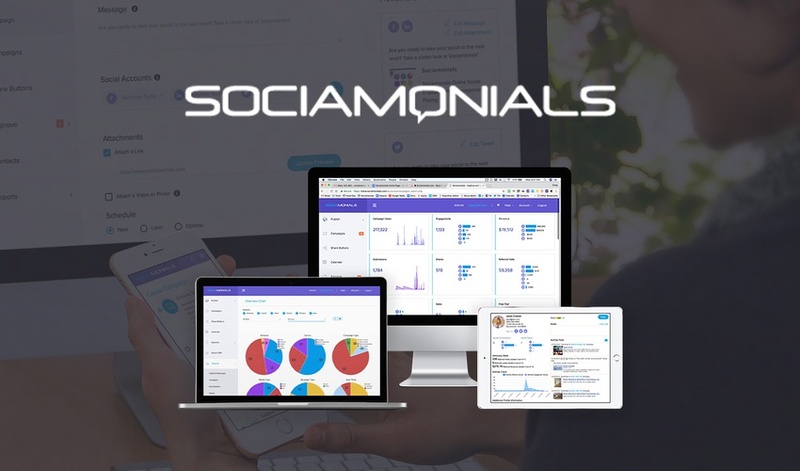 Sociamonials comes with features no other social media tool has all in one place, like automatic reposts of your best content, multi-network sharing, URL shortener, unlimited reports, video testimonials, and agency-level social campaigns (without the agency fees). Competitors only focus on engagement. Sociamonials’ powerful capabilities go above and beyond to revenue and leads. 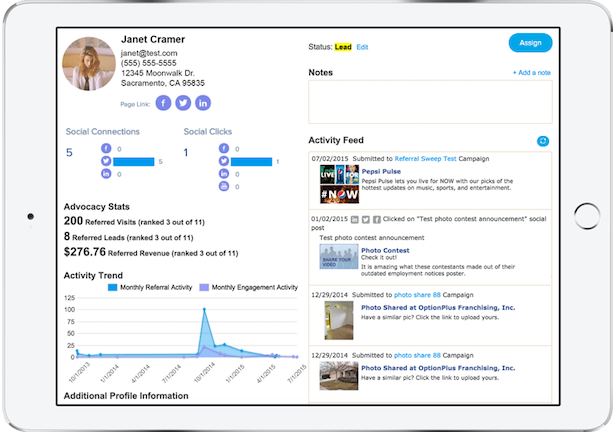 Plus, you'll be able to pinpoint which influencers are brining you the most traffic and sign-ups! Running the social media for your small business can sometimes feel like an uphill battle. And unlike that cute animal Instagram with hundreds of thousands of followers, you don’t have baby hedgehogs on your side to bring in the social media traffic. Luckily, you’ve got something better. Join the successful brands, agencies, and e-commerce shops around the world that use Sociamonials for smarter social media. Get lifetime access to Sociamonials while you still can! P.S. Learn how to use Socialmonials like a pro! Click here to watch a replay of the demo & walk-through.